2 Bedrooms/ 2 bathrooms, spacious living room, portable A/C units, and outdoor patio in the heart of Saint Germain des Près. This gorgeous 100 m² apartment is located in a very attractive and historic area of Paris, near the iconic Pont des Arts which has an international reputation as the bridge of romance. It is exactly on rue des Saint Pères and only a short walk to Boulevard Saint Germain, rue de Buci, Notre-Dame, the Louvre and the Invalides. Accessible through a quiet courtyard, this 2 bedroom is situated on ground floor (American first floor equivalent to floor 0 in France)and has a private inner garden patio. The entrance of the apartment gives directly onto the spacious living room, dining room and a large & fully equipped open-plan kitchen. The living room has its own area with 2 double sofas, TV with international channels and unlimited phone calls to the US, Canada & China. This area looks onto the courtyard which offers a unique quiet outdoor patio with a table and 4 chairs elegantly prepared under a large sunshade & surrounded by tall plants. The apartment is also equipped with 2 portable A/C units useful for the hot summer days. On the opposite side of the living room is the dining area with a large dining table for 6 . The connected space allows for a fun and open integration of the dining and cooking spaces. The open-plan kitchen is fully equipped with modern home appliances for cooking and baking (Stoves, oven, microwave, cooking utensils) but also has a fridge/freezer, dishwasher and a Nespresso coffee machine. The 2 bedrooms are far from one another and offer perfect privacy. The master bedroom is furnished with a queen-size bed (160*200), a cable TV offering international channels, and a sofa. It has an en suite bathroom with bathtub, shower, and washbasin. The master bathroom does not have a toilet but there is a separate toilet available near the entrance door. The second bedroom has a queen bed as well as its en suite bathroom with shower, toilet, and washbasin. To finish, the apartment is equipped with washer and dryer on the entrance of the apartment in a closet on the right side. Suitability : children welcome, non smoking only, wheelchair accessible, pets not allowed. GLAMAPARIS (Gestion Location Appartements Meublés A PARIS) is a licensed real estate agency specializing in high-end property management in Paris, specifically in the 1st, 6th, and 8th arrondissements. Founded in 2008, our young team works with dozens of individual property owners, who trust us to ensure the quality of their secondary homes. We aim to make the renting process simple and secure, facilitating the reservation process, and providing support throughout your stay. Our services include on-site check-in, maintenance, and professional cleaning services. Personal yet professional, GLAMAPARIS is passionate about our city, and hopes to help you experience its very best! This property is particularly spacious for a Parisian home. It has 2 separate bedrooms with their ensuite showers. The master bathroom has both a bathtub and a shower. Each bedroom is equipped with a portable A/C unit for hot summer days. The charm of this property is having the light come in from the outdoor patio that is accessible from the living room and second bedroom. Once your booking is confirmed on the HomeAway platform, we will contact you with further details regarding your check-in organization. We suggest a private transportation company with whom we have been working for a couple years now. They will have a driver wait for you at the airport and drive you to the apartment or our office (in case the apartment is not ready). Rates can be provided upon request. As Paris real estate professionnals since 2008, we offer to all our tenants an insurance policy covering involuntary rental risks (up to 2500€), and civil liability (mandatory in France). A representative will greet you at the apartment with the keys. This service is free of charge, with the exception of late check-ins from 7pm, Sunday check-ins, and holiday check-ins. These incur a 50€ fee. After 10pm, the fee increases to 75€. Every booking with GLAMAPARIS includes liability and rental risk insurance. We are committed to clean our apartments with organic household products only. To make the world a better place, we must start with ourselves. 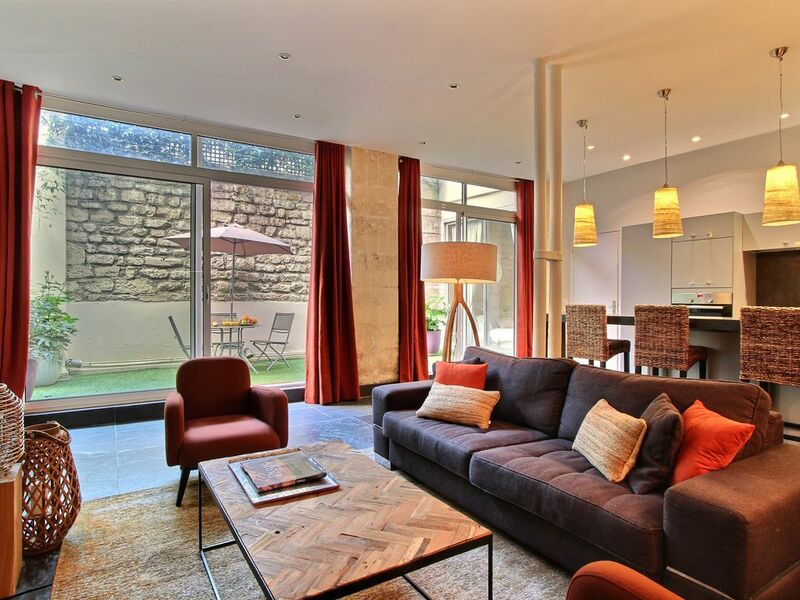 Located on the rue des Saint-Peres, just next to the river Seine, the apartment is in one of the most beautiful parts of Saint Germain des Près. By foot you can access some of Paris' best cafés and restaurants, as well as countless boutiques, art galleries, and monuments. The apartment is an ideal base for sightseeing. Nearby attractions include: the Pont des Arts, Saint Michel fountain, Saint Sulpice Church, Notre Dame Cathedral, the Cluny Museum, the Luxembourg Gardens and the Louvre Museum... All attractions are easily accessible by either foot, bus, or metro.